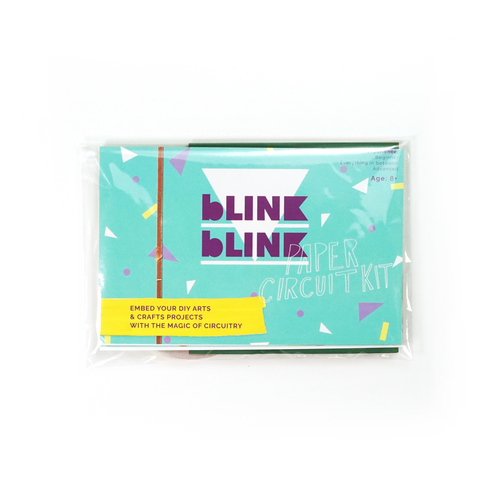 blink blink Creative Circuit Kits is a series of kits and online platform that inspires kids to create and play with technology. The kits provide tools to make DIY arts, crafts, and fashion projects embedded with circuits. blink blink was created with the goal of providing kids with a playful experience of producing and creating with technology. blink blink started as an academic thesis collaboration with Joselyn McDonald with support from the New Challenge Grant. Following our studies, I went on to develop blink blink as a business with Alex Tosti- expanding our product line from 1 to 6 kits, building out our ecommerce site, selling in 7 specialty retail stores, and creating partnerships with NASA Space Apps Challenge, Girl Scouts, Kickstarter, and more. Each of our kits come with printed tutorials, and a number of video tutorials are hosted on blink blink's DIY and Getting Started pages. We have prototyped various designs including GIF based tutorials, print, and video. blink blink was "The Hot New Trend" via Fortune and mentioned in Time Magazine. blink blink was also showcased at CES, SXSW, and NY Tech Meetup. Only 24% of the STEM workforce is comprised of women in the United States due to a lack of access of the following during adolescence: visibility of women STEM role-models, introduction to exploring technology, and STEM education spaces. This problem is well known and researchers across academia have pursued investigating what happens during adolescence that results in less women entering the STEM field and developing solutions to reverse the statistics. Those researchers include Linda Warner, Leah Buechley, and countless others. Before ideating through possible solutions to the challenge, we researched the barriers entering STEM fields/environments and kit based learning by reading academic papers and interviewing researchers in the field. There are many barriers to entering and exploring STEM fields including a lack of visibility of women role-models, limited access to tech materials and curriculum, unwelcoming or male-dominated STEM education spaces, and a lack of positive reinforcement from mentors and family [Linda Warner, Researcher]. STEM-learning environments, cultures, and curricula are rarely designed with empathy for girls and young women, which has resulted in the steady decrease of women in STEM majors and careers since the 1980’s [NPR]. Although there are existing organizations and kits aiming to solve this issue, many of these are black boxing technology or do not provide an early introduction to technology prior to coding. When desinging, choose black boxes carefully. The goal is to instill confidence while learning. Learning styles are varied; therefore, learning tools must support many exploration avenues and learning systles. To reveal more about the barriers young women face exploring STEM, we conducted user interviews, observed classrooms, and after school learning environments. Our research took place in New Orleans, New York, and New Jersey, visiting various demographics as well as learning environments including robotics clubs, fashion clubs, maker spaces, and home school environments. Young women knew a lot about code focused activities, but wanted to explore different avenues of technology before trying to code. Women led robotics clubs and maker spaces had higher numbers of young women ages 8-18 in their spaces. Parents had a large influence regarding students involvement in a maker space. Parents are interested in buying educational toys/kits for their kids at younger age points. For students in high school, parents only buy something if their child wants it. Kids were well aware of digital technologies, but less familiar with DIY hardware culture. Over the course of the design process, we continually ideated on what the solution could be. Our first solution was to build a curriclum that aligned with common core standards and could be distributed into school systems. 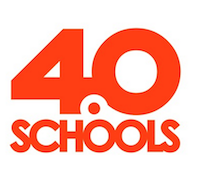 After investigating how products are released into school systems and realizing the lengthy process it takes to become an approved vendor, we decided to develop a consumer facing product and online platform. 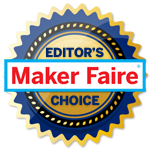 Our high level solution was to create a series of kits that provided soft-circuit materials (conductive fabrics, threads, sewable electronics) to make DIY arts, crafts, and fashion projects that was accommodated by online video tutorials and a maker community. Find the best soft circuit materials for playful learning experiences with electronics and technology. Thus, materials that provided users with quick feedback for technical confidence, as well as materials that had the capability to teach basic engineering and interaction design concepts. The success rate of various tutorial formats: print, imagery, GIF, video, exploratory focused, project focused. Aesthetic designs our users were drawn to. What environments blink blink kits were most successful in creating a playful learning experience (i.e. classroom, after school program, at home)? After user testing, we had narrowed down our soft circuit materials list and piloted our first kit which was an inventors box that came with a variety of materials to make a wide range of projects. Our end goal was to develop a product line and online platform that provided a welcoming and inviting space for girls, promote female role models and mentors in STEM fields, and increase access to materials and curriculum. Our goal was to have each part of our system driving the consumer cycle. Below are prototypes we created at varying stages of blink blink's development.